As of October 2018, Coinut (Coin Ultimate Trading) Cryptocurrency Exchange joined with Zcash (ZEC) to allow users to trade ZEC using Canadian Dollars (CAD), US Dollars (USD) and Singapore Dollars (SGD). This groundbreaking initiative enables users to easily deposit or withdraw fiat currencies like CAD, USD and SGD, into a Coinut account to buy or sell ZEC and store it securely in their Coinut wallet. Till today, more than 90% of cryptocurrency exchange platforms only offer crypto-to-crypto trading pairs. As such, having more fiat-to-crypto trading option is a welcome sign for cryptocurrency traders around the world. Wang Xinxi, CEO of Coinut highlights, “We are delighted to partner Zcash and support the trading of ZEC using fiat currency, because we believe in the intrinsic value of the ZEC token. 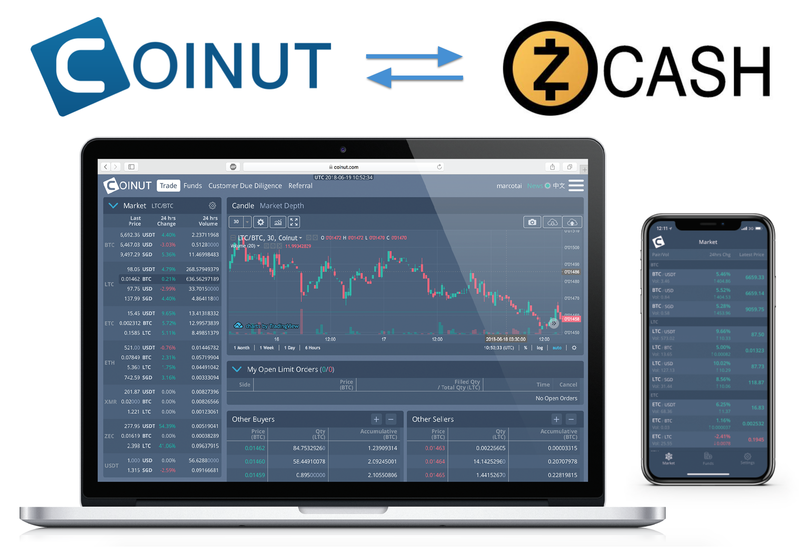 Zcashers can now freely trade ZEC token using fiat currency through the Coinut platform. As a registered Money Service Business in Canada (FINTRAC), we ensure that our trading platform is strictly compliant with the KYC/ AML regulations. We actively strive to make it easier for anyone to deposit their money and trade cryptocurrency, without additional transactional costs." Coinut currently allows users to trade 7 different cryptocurrencies (Bitcoin, Zcash, Litecoin, Ethereum, Ethereum Classic, Monero, Tether) using 3 different fiat currency (CAD, USD, SGD). This partnership highlights a growing trend of integration between cryptocurrency and fiat currency globally. Financial regulators, such as banks, are increasingly more open towards allowing exchanges to offer fiat currency to trade digital tokens.